Dancing- it’s something we all do from time to time, but not all of us are dancers. Dancing for fun and dancing competitively are two completely different things that require two completely separate mentalities. Both take skill to some degree, but there is a lot more on the line with competitive dancing. While it definitely is not easy to be a competitive dancer, it does take a great amount of personal development and commitment to get to that level. Here are some ways that dancing makes you a better person no matter what level you are doing it at. In any type of sport, it is essential to keep your body functioning at an optimal level to maximize your performance. A healthy diet, balanced exercise routine, regimented sleep, and generally healthy habits are absolutely crucial to dance at any level, let alone competitive dance. Keeping your body and mind in good health will keep your moods stable and will allow you to perform at your best for a much longer time. A unique component of dance is that while it is often a partner activity, individual performance is just as important as team functionality. In dance, there are no benched players or defense hanging back. It is up to you and your dance partner to put on a great performance. This subtle communication between you and your dance partner will make you more in tune with the body language and social cues that non-dancers could very easily gloss over. 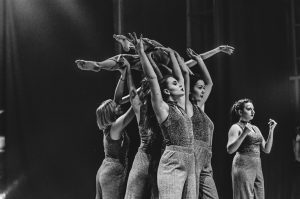 When you are a dancer that is a crucial piece to the team or to your partnership, there is a definite level of responsibility that comes with that. Feeling obligated to be on time to rehearsal, to give your best effort, and to continually work hard are all values that many people never learn. The longer you stick with dance, the stronger these values become, and that is something that will unquestionably give you the upper hand in both the dance world and your personal life. When dancing at the competitive level, criticism simply comes with the territory. To improve, it is a necessary evil to have each one of your flaws pointed out to you in order to improve. While this certainly does not mean you have to endure mistreatment or verbal abuse, it helps you take a back and objectively assess how you look in the eyes of the judges. While you may feel like you are performing something perfectly, it could look completely different to the trained outside eye. Welcoming constructive criticism will not only make you a better dancer, it will make you a better person outside of the studio, too!